On its March 1999 launch, the $51,900 entry price for a manual IS200 was hefty. 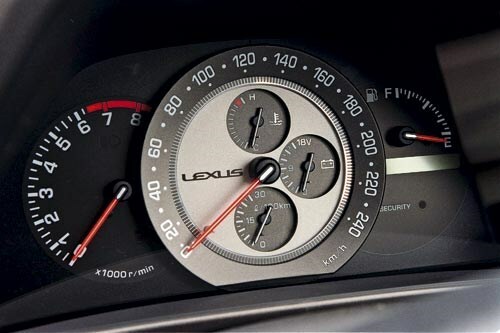 But compared to the silly money asked for the basic BMW 318i, Lexus equipment, Toyota reliability and six-cylinder grunt soon had buyer attention. Quality back-up from the start underpins the IS200’s reputation but buyers need to be wary of private import Toyota Altezza’s equivalent lurking behind Lexus badges. The sedan’s generic looks have defied the years by not pandering to any trend even if the chronograph instrument pod can now look contrived. The sweet 114kW/195Nm 2.0-litre inline six can give it an edge but the 4600rpm torque peak, optional four-speed auto and 1400kg conspired to slow things down off the line and lift fuel consumption over bigger sixes as soon as the revs climbed. Engine can adjust to 98RON for more grunt and economy. Despite a double wishbone rear end, the long lump over the front, short wheelbase and light rear can make it tail happy if everything is not right. Cloth trim was standard while leather came with the luxury option. 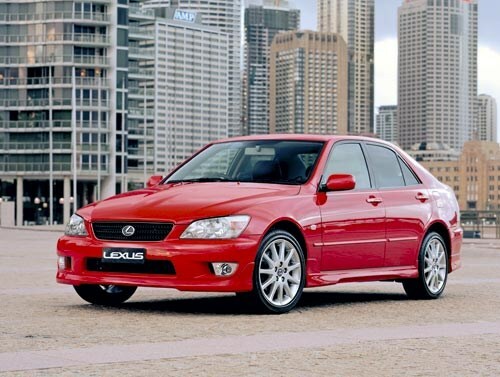 The August 2001 upgrade had cleaner styling, extra cabin detailing and a new dual exhaust system, while the final July 2004 upgrade lifted the base trim levels and boosted wheel size. There were yellow (2000-01), red Caliente (2002) and platinum (2003-04) limited editions before this series was replaced at the end of 2005. Computer change to deliver extra vacuum assist to the brakes on start-up. Check that it was done. Dealers maintain that the IS200 is exceptionally reliable, a reflection of the build quality and exceptionally strong construction but as early cars approach 200,000km there can be several big ticket items waiting. Cam belt is due at 150,000km. Replacing main tensioner at the same time is advisable. Water pumps can leak from 70,000km so replacing an early water pump with cam belt can save on later labour costs. Top strut plates can wear and create rattles. A thump as IS200 rebounds from a speed hump is likely to be a broken engine mount, not suspension. Rear shocks can let go and expel fluid for dodgy handling. Annual four wheel alignment essential. Original 16-inch wheels were perfectly suited for local conditions while later 17-inch style can tramline, making handling fidgety on broken surfaces and generating wheel bearing-type drone if fitted with unsuitable tyres. Front brake rotors can require machining or replacement from 40,000km. Check that all underbody aero panels are present and undamaged as they’re not cheap. Manual gearbox better exploits peaky engine but can be notchy, especially 1-2 shift when cold. Slipping or worn clutch can be a $5000 replacement with dual mass flywheel. Private import Altezzas had 3SGE/3SFE four cylinder engines and Toyota-badged steering wheel airbag.